I was brought up in Manchester where, famously, it rains. Living in Teddington in West London, I notice that it doesn’t rain as much as it did when I grew up. 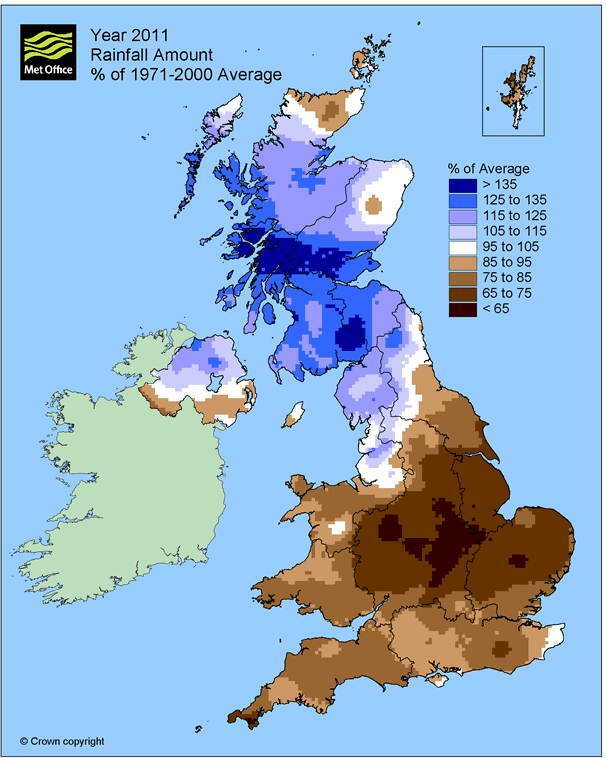 But I was still surprised to find that the South East of England is in a drought! And that’s the point of this article: individually we have a very poor perspective on the slow changes in weather patterns that we call ‘climate’. Fortunately, I live in the UK and we have possibly the best meteorological service in the world! So I can look at the Met Office Web Site. There one can examine maps like the one above for a variety of climate variables, showing how data for a quantity in a particular year or month compares with the average of that quantity over a 30 year period. OPtions for plotting graphs on the Met Office Web Site. 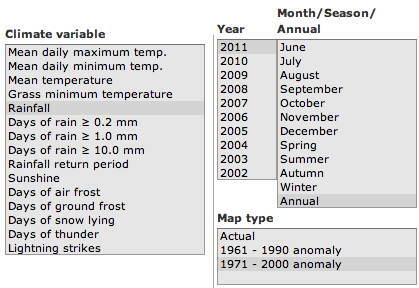 Data can be annual or monthly and a variety of meteorological variables can be plotted. The ability to compare a year or a month with the 30 year averages is something at which we as individuals are chronically bad. But the statistics are reliable and they are available for us all – we paid for the data collection! The Met Office even have historic data from climate stations – an enormously valuable resource. So just for the hell of it I downloaded the data from Heathrow Airport. I plotted data for how the maximum daily temperature varied since 1948 – with the data averaged over a month and over a year. This chart shows the maximum daily temperature at Heathrow Airport averaged over one month (blue) and one year (red) from 1950 until 2010. Data downloaded from the Met Office. Click for larger picture. And then just for the hell of it – I had had a glass of wine! – I also plotted the decadal (10-year) averages. Monthly (Blue) , Annual (Red) and Decadal (Green) averages of the maximum daily temperature at Heathrow Airport from 1950 until 2010. Can you see a trend? Click for larger picture. Having this data available is fantastic. We should be proud of funding a service which makes this data available. You can download it for several sites in the UK and see how the data varies. Have any sites cooled? There is absolutely no way that an individual human being could have sensed such a tiny change in daily maximum temperature. So I agree with one part of the famous quotation: There are lies, damn lies, and then there are statistics. But in this case I think it is statistics that we need to look to in order to find truth. This entry was posted on March 12, 2012 at 7:00 am and is filed under Climate Change, Environment, Personal, Simple Science. You can follow any responses to this entry through the RSS 2.0 feed. You can leave a response, or trackback from your own site.